This is my sample card. Swing there and check out the one she made and then give the challenge a try yourself! I choose the images because she likes faeries :) and well so do I! 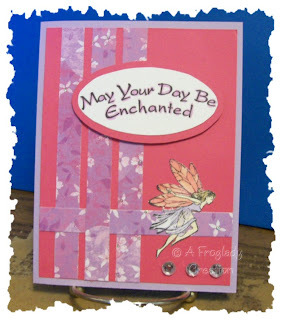 Plus I was having a pretty good day so an enchanting day sounded delightful! Paper is from Hollo's, The Paper Place and DCWV Pocket Full of Posies mat stack. Anna loves glitter too so the paper is a little glittery and then I added the sparkly bling to complement it. I used my Copic markers to color the faerie E53, RV13, E00, BV00 and R20. I also used the marker around the sentiment to give it a little oommph! Leave me a link if you give her challenge a try - I would love to check it out! Watch for more challenges to come from her too she has some great ideas things to come!